Here is the final volume of the Complete Colgems Singles. This volume features music by P.K. Limited, the Monkees, and Sally Field. The label was basically in tatters by 1970, although it still was producing 45s, LPs, and Monkees cereal box records to help promote the Monkees TV show, which had moved over the Saturday mornings on CBS. P.K. Limited released a couple of singles during these last days, mainly tied into their work on the soundtrack of Getting Straight. Their song "Just My Imagination" was actually the B side of two singles during this period, including the label's final single, with a cover of the Monkees "Shades of Gray" being the A side. "Getting Straight" and "Feelings" were also from the film. The Monkees final single was actually with just two Monkees. Even though Michael Nesmith was contractually bound to the project--and actually appeared in a few commercials promoting the Nerf line of indoor playthings--he had moved on to his own solo career, the first album of which he actually reworked a few Monkees songs in a more country-rock vein. So the Monkees were left to Micky Dolenz, Davy Jones---and Jeff Barry and Andy Kim. 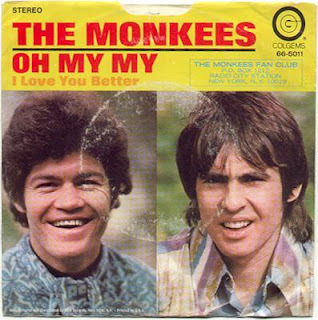 To help promote the TV show on CBS--and to fulfill their contracts--the Changes LP came out, which, as Davy Jones has stated, was the Monkees doing their Andy Kim album, as a good number of the tracks were written and produced by Barry and Kim. There was little that could be called creative on the album, although "Oh My My" was sort of a soul/bubblegum conglomeration that Micky Dolenz aced but the public didn't buy, even with extensive promotion and a video shown during the CBS reruns featuring Micky and Davy on motorcycles. The cereal box singles led to a premium album, Golden Hits, and for one last hurrah, Barrelful of Monkees, a cheap looking greatest hits album, was released to little fanfare. Colgems Records was turned over to Bell Records in 1971, and a leftover single from the Changes sessions, credited to Micky and Davy, was eventually released. The ride was a good one, but it was over. Since then, the Monkees catalog has been well released by Arista and later Rhino, and a smattering of the other acts have had some songs legitimately released on a variety of compilations. I hope this look at the singles that were produced by Colgems from 1966 to 1971 was illuminating, showing that he label was much more than just the Monkees. P.S. : The Sally Field song that I included was released as a promo a few years earlier. 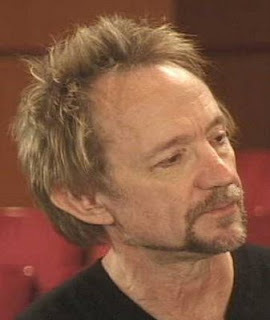 I just wanted to wish a happy 67th birthday to Colgems alumnus Peter Tork. He is the oldest of the Monkees, and is still "Monkeeing around" with his current band playing the blues. There was some tomfoolery done with his birthday year during his time with the Monkees. 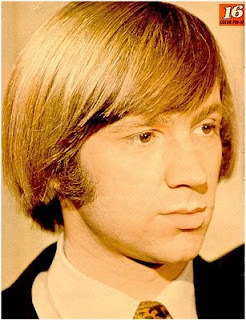 Some sources stated that he was born in 1944, so as to make him younger than Michael Nesmith, the acknowledged leader of the band, but Tork's actual birth year is 1942. Nesmith won't be 67 until December 30.